OSWEGO – The Oswego High School Softball Club will host a chicken barbeque on March 8 from 11 a.m. until sold out at Gibby’s Pub, West Second and Lake streets in Oswego. 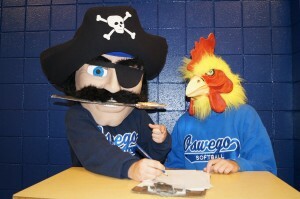 The Oswego Buccaneer and the Oswego Chicken got together recently to plan for the OHS softball team’s spring chicken BBQ. Pre-sale dinners should be picked up by noon. A limited number of dinners will be available for walk-ins. The menu includes chicken, salt potatoes, baked beans, a roll, and dessert. Dine-in, delivery, or take-outs are available. Presale tickets are available from any Oswego High School Softball Club member or at the door. Due to limited quantities, we ask that you pick up your pre-sale dinners before noon. Proceeds from the barbeque will help send the Lady Bucs on their biannual spring trip to Florida. For more information, call Sue Cook at 529-6166.